There is no artiste in Zimbabwe that can keep a crowd on its feet for a good three hours like Winky D and that's what he did on a chilly Thursday night at Hartsfield Tshisanyama in Bulawayo. And fans know that when they go to a Winky D show, they won't leave with any regrets of parting with their hard earned cash and precious time. Normally, when Winky D is in Bulawayo, he performs alongside someone else, be it Jah Prayzah or a South Africa act, but this time, his fans had him all to themselves. His performance was the most anticipated in the city and fans did not disappoint as they packed the venue showing that Winky D is still the most sought after act in the city. With his catalogue of hits, Winky D kept the crowd engaged all throughout the night from the moment he jumped on stage at 12.30AM. When the crowd heard his signature "ya hear dat" chant, they went into a frenzy. 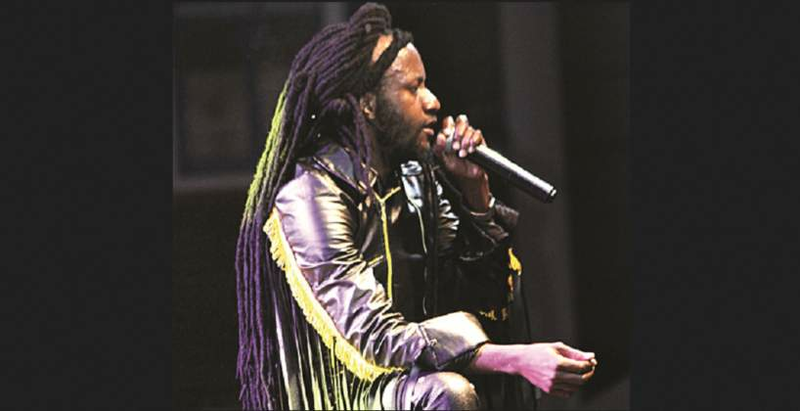 To show how much he wanted to connect with the Bulawayo audience, Winky who was clad in an all black outfit did away with his signature turban and showed off his long dreadlocks for all and sundry to see. This was a special moment for many as he hardly shows off his hair. Barricades that separated him from his fans were pulled down by the sheer number of people crammed at the venue as they wanted to have a closer glimpse of their icon. Police details had to use truncheons to ward off their misdemeanour. That however, did not deter Winky D as he relentlessly set the bar high with his first five songs and got people dancing and in awe with everything he was doing on stage. There was no time to rest or even relieve oneself during the show, a hallmark that has made his concerts a must attend. Winky D only rests when he starts speaking to fans and readying them for the next song and the whole process starts again, jumping, dancing singing along, and waving of jerseys, sweaters, T-shirts. Fans had come to listen to Winky's latest album Gombwe which has the hit song Ngirozi and Finhu Finhu among others. When he performed Ngirozi, he did not have to sing anything at first as his band Vigilance provided the base line for people to sing the first verse word for word. Winky D only joined in when singing the chorus and the second verse. That song was performed repeatedly over five times as people could not get enough of it. When people thought that this was the end of the show, Winky D continued delving into his old hits that took people down the path of reminiscence. This was a time for the Winky D fans who knew him before during the Igo Figo days, before he was called Gafa, Ninja President, chiExtraterrestrial and other monikers to reminisce. He further wowed the crowd when he performed Disappear, a song that they had almost forgotten and remembered when he told them that he wants to make them disappear. Finally concluding his set at 3AM, Winky D performed Finhu Finhu leaving many tired, shoes and legs knee deep in dust and satisfied that being at a Winky D show was worth their while. Worth a mention are the local DJs who held their own before Winky D took to the stage. Champion Sounds, who were the reason that 3D Events even thought of bringing Winky D in the first place after working up the crowd during the Jah Prayzah trade fair shut down show at the same venue, were at their usual best. The duo of Crazy Black and Ras Obido know what they are doing on stage as they threw down some heavy mixes of Zimdancehall and hyped up the crowd. It seems that DJ Liz and Crazy D are now a duet and the ladies gave the crowd hard hitting Gqom music. The chemistry they have on stage will likely take them places.